A motor-driven six-cylinder reciprocating compressor that can operate with two, four or six cylinders. Compressors are similar to pumps in that both increase the pressure on a fluid and both can move the fluid through a pipe. As gases are compressible, the compressor also reduces the volume of a gas, whereas liquids, being relatively incompressible, receive from a pump an energy of motion that propels them through a pipe. 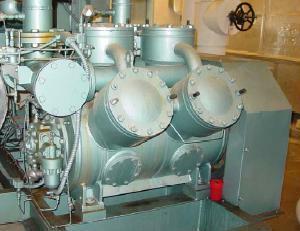 Gas compressors are useful for a wide variety of applications, including: Transporting natural gas through pipelines, storing purified gases in small volumes, compressing intake air in gas turbines, pressurizing aircraft cabins, moving heat in refrigeration systems, storing air in submarines, and providing compressed air for air brakes. There are many different types of gas compressors. Some of the important types are discussed below. 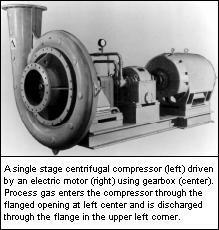 Figure 1: A single-stage centrifugal compressor. Centrifugal compressors use a vaned rotating disk, or impeller, in a shaped housing to force the gas to the rim of the impeller, increasing the velocity of the gas. A diffuser (divergent duct) section converts the velocity energy to pressure energy. They are primarily used for continuous, stationary service in industrial settings such as oil refineries, chemical and petrochemical plants and natural gas processing plants. Their application can be from 100 horse power (hp) (75 kilowatts, or kW) to thousands of hp. With multiple staging, they can achieve extremely high output pressures greater than 10,000 pounds per square inch (psi) (69 Mega Pascals, MPa). Many large snow-making operations (like ski resorts) use this type of compressor. They are also used in internal combustion engines as superchargers and turbochargers. Centrifugal compressors are used in small gas turbine engines or as the final compression stage of medium sized gas turbines. Diagonal or mixed-flow compressors are similar to centrifugal compressors, but have a radial and axial velocity component at the exit from the rotor. The diffuser is often used to turn diagonal flow to the axial direction. The diagonal compressor has a lower diameter diffuser than the equivalent centrifugal compressor. An animation of an axial compressor. Axial-flow compressors use a series of fan-like rotating rotor blades to progressively compress the gas flow. Stationary stator vanes, located downstream of each rotor, redirect the flow onto the next set of rotor blades. The area of the gas passage diminishes through the compressor to maintain a roughly constant axial Mach number. Axial-flow compressors are normally used in high flow applications, such as medium to large gas turbine engines. They are almost always multi-staged. Beyond about 4:1 design pressure ratio, variable geometry is often used to improve operation. Reciprocating compressors use pistons driven by a crankshaft. They can be either stationary or portable, can be single or multi-staged, and can be driven by electric motors or internal combustion engines. Small reciprocating compressors from five to 30 horsepower (hp) are commonly seen in automotive applications and are typically for intermittent duty. Larger reciprocating compressors up to 1000 hp are still commonly found in large industrial applications, but their numbers are declining as they are replaced by various other types of compressors. Discharge pressures can range from low pressure to very high pressure (>5000 psi or 35 MPa). In certain applications, such as air compression, multi-stage double-acting compressors are said to be the most efficient compressors available, and are typically larger, noisier, and more costly than comparable rotary units. Diagram of a rotary screw compressor. Rotary screw compressors use two meshed rotating positive-displacement helical screws to force the gas into a smaller space. These are usually used for continuous operation in commercial and industrial applications and may be either stationary or portable. Their application can be from three hp (2.24 kW) to over 500 hp (375 kW) and from low pressure to very high pressure (>1200 psi or 8.3 MPa). They are commonly seen with roadside repair crews powering air-tools. This type is also used for many automobile engine superchargers because it is easily matched to the induction capacity of a piston engine. A scroll compressor, also known as scroll pump and scroll vacuum pump, uses two interleaved spiral-like vanes to pump or compress liquids and gases. The vane geometry may be involute, archimedean spiral, or hybrid curves. They operate more smoothly, quietly, and reliably than other types of compressors. Often, one of the scrolls is fixed, while the other orbits eccentrically without rotating, thereby trapping and pumping or compressing pockets of fluid between the scrolls. A diaphragm compressor (also known as a membrane compressor) is a variant of the conventional reciprocating compressor. The compression of gas occurs by the movement of a flexible membrane, instead of an intake element. The back and forth movement of the membrane is driven by a rod and a crankshaft mechanism. Only the membrane and the compressor box come in touch with the gas being compressed. Diaphragm compressors are used for hydrogen and compressed natural gas (CNG) as well as in a number of other applications. 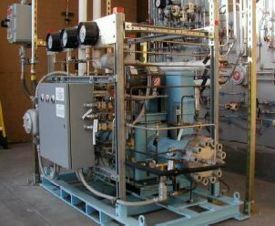 The photograph included in this section depicts a three-stage diaphragm compressor used to compress hydrogen gas to 6,000 psi (41 MPa) for use in a prototype hydrogen and compressed natural gas (CNG) fueling station built in downtown Phoenix, Arizona by the Arizona Public Service company (an electric utilities company). For the prototype fueling station, reciprocating compressors were used to compress the natural gas. The prototype alternative fueling station was built in compliance with all of the prevailing safety, environmental and building codes in Phoenix to demonstrate that such fueling stations could be built safely in urban areas. Air compressors sold to and used by the general public are often attached on top of a tank for holding the pressurized air. Oil-lubricated and oil-free compressors are available. Oil-free compressors are desirable because without a properly designed separator, oil can make its way into the air stream. In a given use, for example as a diving air compressor, even minimal oil may be unacceptable. Isothermal—gas is maintained at constant temperature throughout the process because internal energy is removed from the system as heat at the same rate that it is added by the mechanical work of compression. Isothermal compression (or expansion) is favored by a large heat exchanging surface, a small gas volume, or a long time scale (that is, a small power level). With practical devices, isothermal compression is usually not attainable. For example, even a bicycle tire-pump gets hot during use. Adiabatic—In this process no heat is transferred to or from the system, which means that all the mechanical work of compression is received into the gas as increased internal energy manifested as an increase in temperature or pressure or both. Theoretical temperature rise is T2 = T1•Rc((k-1)/k)); T1 and T2 are in degrees Rankine or kelvins; k = ratio of specific heats (approximately 1.4 for air); and Rc = compression ratio (p2/p2) with pressure "p" measured in absolute units of air pressure plus gauge pressure. Adiabatic compression or expansion is favored by good insulation, a large gas volume, or a short time scale (that is, a high power level). In practice there will always be a certain amount of heat flow, because making a perfect adiabatic system would require perfect heat insulation of all parts of a machine. Polytropic—This assumes that heat may enter or leave the system, and that input shaft work can appear as both increased pressure (usually useful work) and increased temperature above adiabatic (usually losses due to cycle efficiency). Cycle efficiency is then the ratio of temperature rise at theoretical 100 percent (adiabatic) vs. actual (polytropic). Since compression generates heat, the compressed gas is to be cooled between stages making the compression less adiabatic and more isothermal. The inter-stage coolers cause condensation meaning water separators with drain valves are present. The compressor flywheel may also drive a cooling fan. For instance in a typical diving compressor, the air is compressed in three stages. If each stage has a compression ratio of 7 to 1, the compressor can output 343 times atmospheric pressure (7 x 7 x 7 = 343 Atmospheres). Gas turbines power the axial and centrifugal flow compressors that are part of jet engines. Steam turbines or water turbines can be used to power large compressors. Electric motors are cheap and quiet power sources for static compressors. Small motors suitable for domestic electrical supplies use single phase alternating current. Larger motors can only be used where an industrial electrical three phase alternating current supply is available. Diesel engines or petrol engines are suitable for powering portable compressors. In storing purified or manufactured gases in small volume, high pressure cylinders for medical, welding and other uses. ↑ Compressed Air Challenge, Introduction to Industrial Compressed Air Systems. Retrieved August 11, 2007. Brown, Royce N. Compressors, Selection and Sizing, 3rd edition. Burlington, MA: Gulf Professional Publishing, 2005. ISBN 0750675454. Elliot, Brian. Compressed Air Operations Manual. Columbus, OH: McGraw-Hill Professional, 2006. ISBN 0071475265. Feller, Eugene W. F. Air Compressors: Their Installation, Operation and Maintenance. Columbus, OH: McGraw-Hill Book Company, Inc., 1944. This page was last modified on 23 July 2016, at 15:58.